Psychology is the study of human and animal behavior. It is a social science and therefore, not definite. Each mind has endured a conditioning of its own. Each individual has been born with a unique "wiring," possibly as unique as his or her own fingerprints and has lived through unique individual experiences. From this arise various thought patterns and consequently, behaviors. However, over the years, psychologists have found a certain organization to this chaos. Albeit not exact, it does contribute to grouping certain individuals and certain triggers together. The study of psychology helps us understand what factors, if applicable, influence a mindset, an action or sometimes even a whole personality. The word psychology has been derived from the Greek words 'Psyche' meaning mind (or soul) and 'Logy' meaning study. It originated as an amalgamation between philosophy and biology. Today, the field of psychology has grown in all directions and is applicable to most walks of life. There is little wonder as to why the number of international students applying to study psychology in the US is growing by the day. For students asking "why study psychology," there are many motivating factors. People have long acknowledged the importance of medical doctors, it has been in recent years that mental health has been given an equal, or almost equal level of importance. It is common knowledge that a person may have all the material wealth possible but without an inner equilibrium, even the most successful people have spiraled downwards. Psychology is a growing and upcoming field of interest which brings many international students to the US in a pursuit to study Psychology. 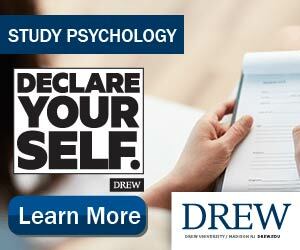 Psychology also pushes students to greater self-awareness, helping students understand their actions and personalities. Another important phenomenon for international students asking the question "why study psychology" is that it opens up a whole world of career options. Despite stereotypes, not everyone who studies psychology ends up being a counselor (though it may be part of the expertise). The American Psychological Association recognizes over 50 subdivisions of psychology, making career options immense for students who study psychology in the US. For example, there are neuropsychologists, social psychologists and industrial organizational psychologists, who have little or nothing to do with mainstream counseling. When a few psychology students were asked the question ‘why study psychology?' or what they liked best about it, their answer was because what they studied was immensely relatable. With psychology they were able to find reason behind phenomenon that they felt was unexplainable. For example, why a certain smell or lighting suddenly reminded them of something in their past, why their dog would come running every time he heard the cabinet door to the dog food open, and why after a stressful day they would yell at their siblings although they were not upset with them. Psychologists are also sought out by companies and organizations. A lot of their marketing and advertising strategies are thought of by psychologists. Companies might also hire psychologists to help them with many aspects important to the success of a company, such as methods to increase productivity, employee job satisfaction and recruitment. The US has always been in the forefront when it comes to research. It is also a fore runner when it comes to psychology. For international students who have found a compelling answer to the question "why study psychology?" it is no doubt one of the best countries in the world to study in. The degrees and diplomas earned in the US are recognized in almost all parts of the world and are also looked at with great reverence. Requirements to study psychology in the US depend on the course an international student wishes to enroll in. For a Master's degree, students are generally required to have the equivalence of an American Bachelor's degree from their country of education. For pursuing a doctoral degree, universities in the US mostly require a student to have an American Master's degree or equivalent. Also, most universities require students to take a GRE exam and a TOEFL or IELTS exam (requirements may vary for each university and generally are country specific depending on whether English is an official language of instruction or not). Admission procedures and requirements may be fairly rigorous when it comes to minimum score requirements in these exams. GPA's are also taken into consideration, although a high score on the GRE may overpower a mediocre GPA. Reference letters and personal essays are also highly important in the application procedure. Relevant work experience may also make for a stronger admission application. Many universities may advise students to seek out a recognized third party credential evaluator to translate their mark sheets and scores. The US has several competent colleges in every state with high quality psychology programs with various specialties. The US system of education encourages hands-on research and spurs individual thinking and growth. Universities and colleges in the US also promote an all-round environment for their students. Across the country, there are colleges to suit most preferences and budgets and many colleges also offer financial aid making education a very possible dream to achieve for many international students who wish to study psychology in the US.